America has moved past the surprise that there are online services which offer investment advice online through algorithms without the aid or supplement of human thought or advice. According to Spectrem research, knowledge and understanding of so-called robo-advisor services has reached new heights. Spectrem’s latest study into investor usage of robo-advisors goes a step beyond the others by surveying only those investors who currently have a ongoing relationship with a robo-advisor. As such, these are people who are fairly knowledgeable about what robo-advisors can and cannot do for investors. The study – Robo-Advisors 3.0 - presents 10 of the best-known robo-advisors in America as of late 2018, including the three most popular and well-known – Fidelity Go, Vanguard Personal Advisor Service and Schwab Intelligent Portfolios. What is unique about investors and robo-advisors is that knowledge of one does not necessarily translate to knowledge about another. 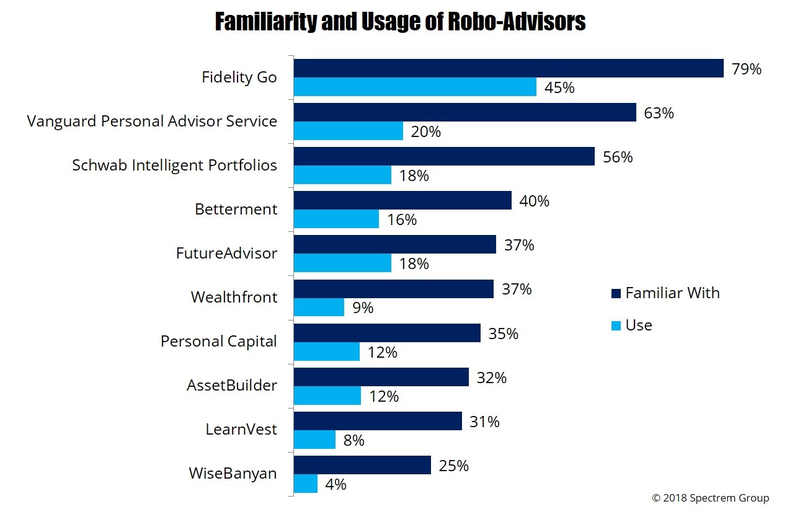 Although the Fidelity, Schwab and Vanguard services lead the market, only 79 percent of robo-users are “familiar” with Fidelity Go, only 63 percent are “familiar” with Vanguard Personal Advisor Service and only 56 percent are “familiar” with Schwab Intelligent Portfolios. Among the seven others on the list of 10 offered to investors in the study, knowledge ranges from 25 percent (WiseBanyan) to 40 percent (Betterment). Knowledge is much higher among young investors than among older ones for the lesser known services. As anticipated, younger investors are more knowledgeable of all the services listed in the study. But there is a massive drop-off of knowledge for the oldest investors, those over the age of 62, after the three most popular services. To begin, more than 60 percent of those oldest investors know about the Fidelity, Schwab and Vanguard services, but only 16 percent know about Betterment, and only 8 percent know about FutureAdvisor, one of the more well-known of the other robo-advisors. That’s a severe reduction in knowledge and indicates that those services may not be advertising to older investors the way they do to younger ones. The study then examines investor usage of robo-advisor services, which is led by Fidelity Go (45 percent), followed by Vanguard Person Advisor Services (2 percent) and Schwab Intelligent Portfolios (18 percent). Betterment, AssetBuilder and Personal Capital lead the other services with 12 to 16 percent of investors using them. These results indicate that many advisors use multiple services. But usage of these services beyond the three most popular ones is almost exclusively by investors under the age of 54. There are investors who turn to robo-advisors as services that are supplemental to human advisors, some investors replace their human advisors with robo-advisors, and some investors use robo-advisors as their first financial professional. According to Robo-Advisors 3.0, 29 percent of robo users did not have a primary financial advisor prior to signing up with the robo program. Of the others, 16 percent used an accountant as their primary advisor, and 9 percent used their banker as their primary advisor. Ten percent of those who signed up with a robo program were using a Full Service Broker as their primary advisor at that time. There appears to be two markets for investors who turn to robo-advisors for service: those who do not have an advisor previously and those who use accountants, attorneys or bankers as their primary advisor before signing up with a robo service. Advisors who want to promote a robo-service as a stepping stone to a more personal advisory relationship need to determine how to reach those two populations to build their provider’s robo service.